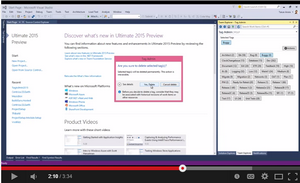 Manage Work Item tags from right with in Visual Studio using the TagAdmin extension. Watch this 2 minute video to get a headstart… Tagging as a feature has been a hit in the Team Foundation Server / Visual Studio Online family of tools. So, the problem as it stands out today is… How do you manage tags in projects and project collections? We are very excited to announce the release of our latest Visual Studio Extension “TagAdmin”… The extension uses the all new REST APIs for retrieving and updating the data in TFS/VSO. The extension makes use of Integrated authentication to ensure all communication between the client & server is through an authorized token flow. The latest version of the extension can be downloaded from the Visual Studio Extension Gallery here.